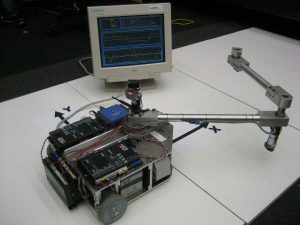 Differential flatness-based integrated point-to-point trajectory planning and control method for a class of nonholonomic wheeled mobile manipulator is presented. We demonstrate that its kinematic model possesses a feedback-linearizable description due to the flatness property, which allows for full state controllability. Trajectory planning can then be simplified and achieved by polynomial fitting method in the flat output space to satisfy the terminal conditions, while control design reduces to a pole-placement problem for a linear system. The method is then deployed on our custom constructed WMM hardware to evaluate its effectiveness and to highlight various aspects of the hardware implementation.